The sweet, soft roasted butternut squash and red pepper are juxtaposed by the sharp taste of the crumbly feta. Combined with the filling and flavoursome cous cous, this dish makes for a healthy and hearty vegetarian dinner. 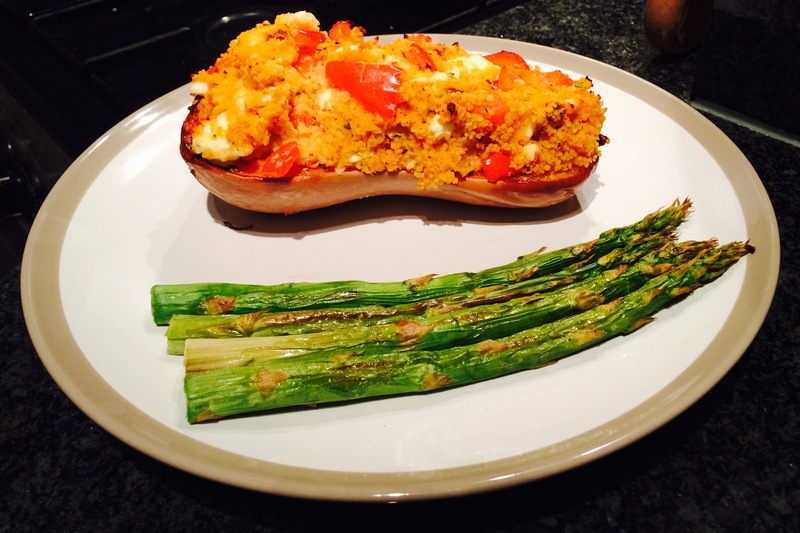 This meal idea is based on a BBC Good Food recipe, substituting quinoa for cous cous. It’s not the speediest of dishes to prepare, as the butternut squash needs roasting for some time before being stuffed with the other ingredients, so it’d be best to make this on the weekend, or when you’re not strapped for time. 8 asparagus spears, or another green vegetable of your choice. 1. Turn the oven on to gas mark 6. 2. Cut the butternut squash in half lengthways, scoop out the seeds and score the flesh diagonally, both ways. Sprinkle the sage over both halves, pop them on a baking tray and drizzle over some olive oil. Place in the oven for 30-40 minutes, until the flesh has softened. 3. Meanwhile, get the filling ready. Prepare the cous cous as per the packet’s instructions (usually pour into a bowl and pour boiling water over so it covers the grains, leaving some extra liquid to be soaked up. Stir well and leave for five minutes). When the grains have absorbed the water, fluff them up with a fork, and pour over the majority of the lemon juice, holding a little back, and drizzle over a little bit of olive oil. Mix the liquids in, so the cous cous remains fluffy and doesn’t dry out. 4. After 30 minutes, take the baking tray out of the oven and carefully place the chopped pepper at the side of the tray. Sprinkle half the rosemary over the pepper and pop back in the oven for 10 minutes. 5. Meanwhile, put the grill on to a medium to high heat. Chop off the bottom ends of the asparagus spears and place on a baking tray. Spray five or six times with the cooking spray, season and place under the grill for 10 minutes, or until nicely brown, turning them every now and again with some tongs or a fork. 6. When the squash and peppers are cooked, take them out of the oven. Tip the peppers into a bowl with the cous cous, spring onions, feta, carrot, and the remaining rosemary and lemon juice. Stir and season well. 7. Press the cous cous filling onto the squash with a metal spoon, and pile it as high as you can! I found that I had some filling leftover, and you could always serve this on the side so it doesn’t go to waste. 8. When you’re ready, put the squash back in the oven for 10 minutes, to allow the cous cous and the feta to begin to golden. 9. Take the asparagus out of the oven and serve neatly on the side of a large plate. 10. Take the squash out of the oven and place it carefully (so the cous cous doesn’t spill out all over the place) on the plate.